QDHP is very proud to work with DHASQ to launch its new website. 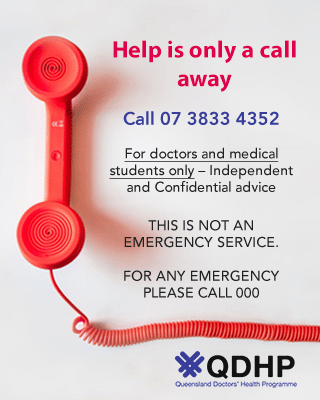 We are keen to provide doctors and medical students in Queensland with access to resources that can assist them to maintain their health and wellbeing. QDHP/DHASQ have been working to support doctors for over three decades through our helpline, education and research. We held the first national doctors’ health conference in Brisbane in 1999. We are committed to advocating for doctors’ health in all forums and continue to work with other medical organisations to deliver education on doctors’ health, including health services access for doctors and caring for doctors. Please visit us at qdhp.org.au for more on what we do, and how you might get involved. Help us get the word out! Please follow us on Facebook and Twitter.